Engage students in a discussion of the power of their words. Students will learn about empathy. Students will learn to take responsibility for their mistakes when they happen and to learn from them. Students will learn to think before they speak and act. Sit with the children and tell them the red construction paper heart represents the heart of a 5th grader (or another grade level). Ask, “How does it look?” Tell them to notice that it is a nice, big, red, happy heart. Say,” When you’re in 5th grade, many things happen each day – some good, some not-so-good. These not-so-good things can really hurt our heart.” Ask the students what someone could say or do to hurt their hearts. As a child gives an example of what could hurt a heart, put one fold in the heart. Continue until you have folded the heart up. 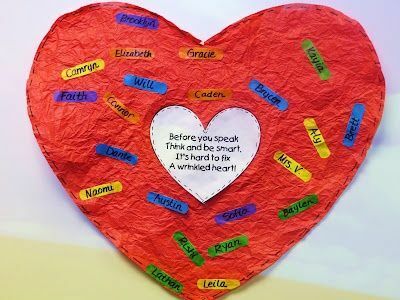 Then ask the children, “What have our hurtful words and actions done to our classmate’s heart?” Answers typically include destroyed it and broken it. Ask how students think this person feels. Discuss. Ask students, “Is there anything we can say or do to fix this heart?” As children give an answer unfold one crease in the heart. Helpful answers may include: Apologize, say something nice, give a compliment, invite them over to play or eat lunch with you, listen to them, talk to them, be a friend to them. After the heart has unfolded, ask the children, “How did we do? Did we fix this heart?” Usually you’ll hear a yes and then “Well, no, because it’s still kind of wrinkled.” Allow them to discuss this. Ask how this person feels now. Lead their discussion to the idea that although we have repaired the heart, the scars are still there. Even when we say we’re sorry, people still remember the hurtful things we did. Ask, “Is it ok for people to do this?” Discuss with them that we all make mistakes and sometimes say or do something hurtful that we didn’t mean. Ask, “What can we do to try to prevent saying or doing something hurtful to someone else?” Lead the discussion to the idea that we can think before we speak. Write on the heart: No one has the right to put a wrinkle on someone else’s heart. Hang the heart in the classroom, therapy room, or send home as a visual reminder to children. Teachers can review the lesson with students as needed by prompting them to look at the heart displayed in the classroom. Teachers can assess the activity through application of character education principles. Still looking for more ideas like this? Here’s another idea. This entry was posted in Management, Student Behavior and tagged bullying, Children, citizenship, Education, Elementary School, Homeschool, Kids, Teacher Resources, Teachers, Teaching by Squarehead Teachers. Bookmark the permalink. I totally agree! And there are so many extension ideas! I’ve heard that the book Chrysanthemums by Kevin Henkes has some good ties to this subject too, but I haven’t researched it… Thanks for stopping by my blog! I had some “mean girl” issues in my second grade class last year and our counselor came in to do an ant-bullying lesson. She used the book Chrysanthemum and used a giant paper heart in her lesson. It really helped the class and I displayed the heart on our wall with my kiddos to refer to throughout the year. That’s a good idea. Teaching kids to be nice to each other is harder than it should be!